I am continuing my quest to incorporate Asian ingredients in my baking after the azuki brioche rolls. I think Asia is calling me for a visit. The not-so-secret ingredient of this post is…black sesame. These unassuming tiny black seeds are packed with a pungent nutty flavor when toasted. The most flavorful ones I’ve had is not surprisingly from Japan. They have exceptionally high standards when it comes to food. Japanese patissier Sadaharu Aoki is known for incorporating traditional Japanese flavors such as black sesame into French pastries. I tasted some of his amazing creations on my second visit to Paris. His boutique in Paris screams modern Japanese minimalism, where every pastry is perfectly executed with a simplistic elegance. 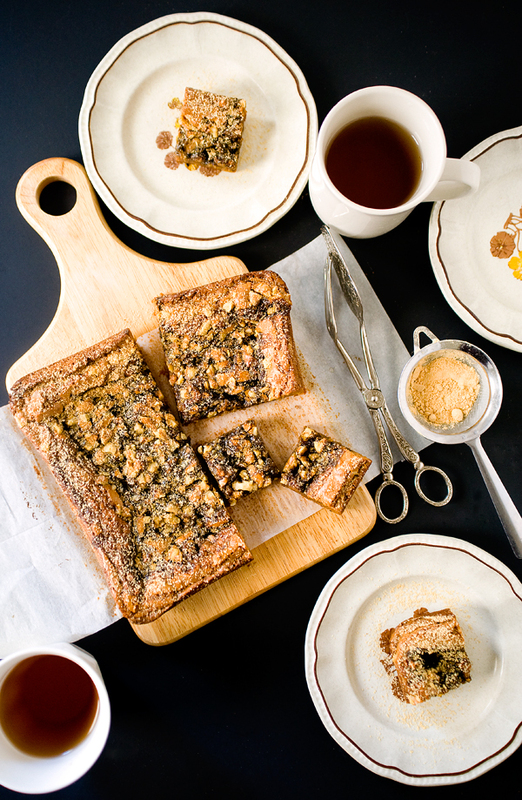 This recipe is nothing like Aoki’s sophisticated pastries, but is rather the exact opposite. 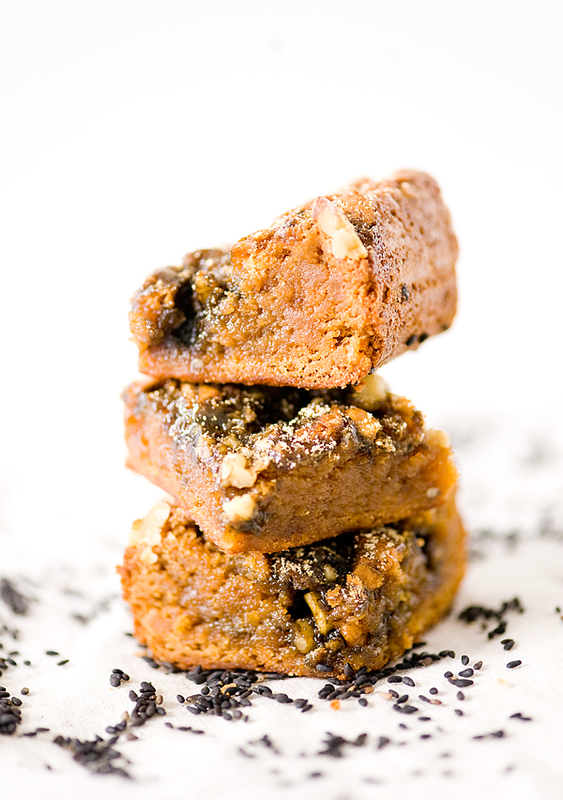 It was evolved from a delicious treat I received from a Filipino friend, mango and cashew butterscotch bars. I really liked the chewiness of the dried mangoes in the bars. I replaced the mangoes and cashews with a sesame caramel and crushed walnuts. Kinako is another classic Japanese sweets ingredient, usually used to coat mochi or dango. It gives these bars another depth of subtle nuttiness. 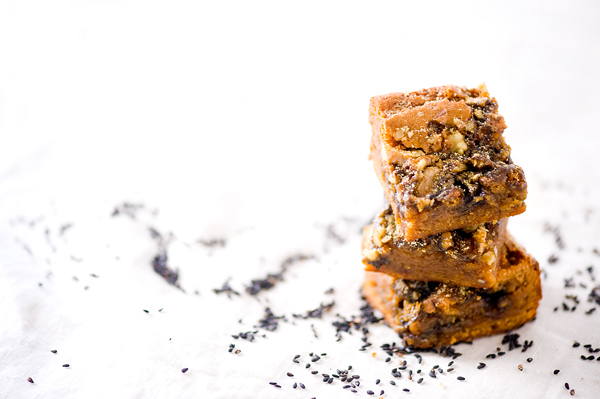 I can’t think of a short name for this treat so sesame caramel kinako butterscotch bars they are. Yield: One 8 inch square pan, sixteen 2 inch squares. In a small saucepan, caramelize sugar over medium heat until it turns into a dark amber color. Swirl pan as the sugar cooks. Try to avoid stirring the sugar to prevent crystallization. Keep an eye on it as it burns very easily. Turn off heat, slowly pour in whipping cream. It might splash, be careful. Turn heat on low, cook caramel until it boils, add salt. Take off heat, cool until it is lukewarm, stir in butter and sesame paste. Cool until ready to use. This recipe will yield more than enough for the butterscotch squares, but it makes a great sandwich cookie filling or spread. Preheat oven to 350 F / 180 C. Butter and line an 8 inch square cake pan with parchment. In a medium bowl, whisk together flour, salt, baking powder, and kinako. In a medium saucepan over low heat, melt butter, stir in brown sugar to break up any chunks. Take off heat, whisk in eggs and vanilla extract. Fold the butter mixture in to the dry ingredients with a silicone spatula until there's no more traces of flour. Pour into prepared pan. Heat up the caramel in the microwave oven for about 30 seconds and drizzle it on top of the batter. Sprinkle with crushed walnuts. Bake in preheated oven for 25 - 30 minutes, until the center is still slightly soft. Cool before serving. To serve, sprinkle with toasted sesame seeds and sift kinako on top if desired. Cut into 16 squares in a 4 x 4 pattern. These taste great at room temperature or chilled. These butterscotch bars are made even more gooey from the sesame caramel. With the contrast of crushed walnuts for texture, kinako for taste, there are three layers of flavor. I love black sesame’s strong toasty aroma. I especially like it as a warm and runny filling inside “tong yuen”, a traditional Chinese sticky rice dumpling served in a warm light syrup. I used a Japanese black sesame paste but the Chinese varieties should work well. If you want, you can make the paste by processing toasted seeds into a paste. An intro to “kinako” – its literal mean is “yellow powder”, it is actually a finely ground roasted soy bean flour originated in Japan. It has a peanut-like flavour, and is a great ingredient for adding a nutty flavour in the place of peanuts if allergy is a problem. You should be able to find these ingredients at Asian or Japanese markets. For chewy bars, remember not to over-bake them. I’ve also posted this on Food 52, check it out here! These keep very well, and can be wrapped and frozen for up to 2 weeks. I like them a little cold, the texture becomes a little fud-gy and more chewy. Another successful baked experiment! i’ve only had kinako with fresh mochi, and would have never thought about using it in dessert! love the idea of pairing it with caramel and sesame. Kinako makes a great baking ingredient, I’ve added it to a shortbread recipe and loved it!